Left to right: Jonathan Haugen, Michael Winters, Judith-Marie Bergan. Photo courtesy Oregon Shakespeare Festival. Eugene O’Neill’s masterpiece Long Day’s Journey Into Night has been long acclaimed for its haunting portrayal of the Tyrone family, loosely based on O’Neill’s early life as the son of former actor James O’Neill. Oregon Shakespeare Festival’s version, directed by Christopher Liam Moore (King Lear) is slow, raw, and painful – the wound at the core of the Tyrone family gradually coming to the harsh light of day. Cast in the role of patriarch James Tyrone is Michael Winters, who can be remembered from his exemplary King Lear last season. Winters’ drawling speech hangs a verbal guillotine over everyone he addresses–there’s an unsettling feeling that even if he’s being nice now, the next instant he might bring down the blade. He plays James Tyrone with incredible depth, creating a figure as pitiable as he is despicable. Though Michael Winters was outstanding, the actor who made the truly most interesting decisions was Judith-Marie Bergan in her role as Mary Tyrone. A common interpretation of the text is to present Mary as the perfect housewife, gradually revealing more and more her painkiller addiction in a cliché Stepford Wives farce. Bergan, however, presents a fierce, high-status mask, someone who has fought against James’ ego for decades and refuses to let him fully control their kids. Her descent into pill-stoked madness becomes all the more heartbreaking when we see how powerful she used to be. Christopher Acebo’s set design takes a lavish 20th-century house, warm colors and multiple stories, then distorts it into a dreamlike realm through judicious use of scrim and suspended props. Carefully inserted pieces of raw wood, including a tree trunk jutting through a staircase at the back of the three-quarters thrust stage, represents the creeping forces that intrude on the life of a family desperately trying to keep themselves together. This is a fitting piece of scenery crafting, and an impeccably subtle one as well – something isn’t right but it takes a while to define what it is. A cornerstone of the American theatre, Long Day’s Journey Into Night could also be considered the cornerstone of the 2015 OSF season. 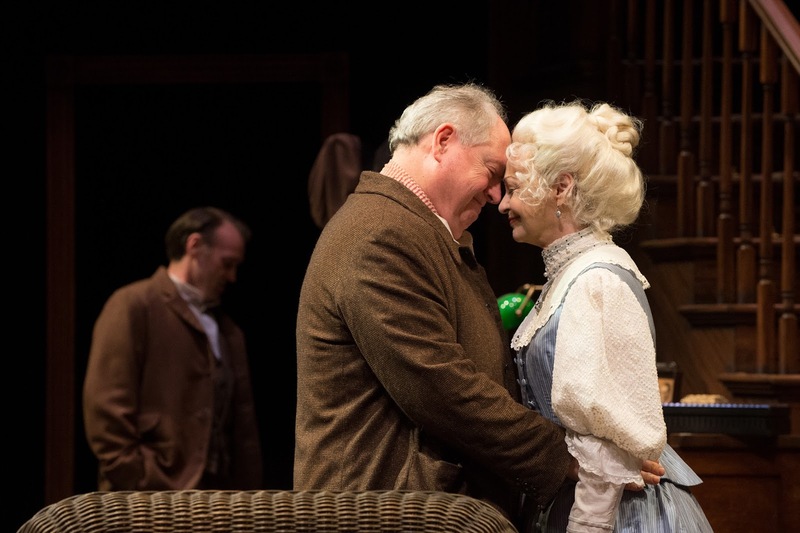 Moore’s version is faithful to the original play, while staged in a way that enhances the intimate tragedy at its heart. If you’ve been waiting for a chance to see one of the most important plays of the 20th century, now is the time.